It is January, 1981, and I’m sitting at my desk in the feature section of the Honolulu Star-Bulletin where I’m a feature writer and weekly sports columnist. Across from me, our desks abutting each other, is Roger Wise, our TV editor. Roger is leaning on his arms, and I’m leaning on mine, and we’re deep in conversation when suddenly he looks up, his eyes widen and his mouth falls open. I start to turn around, but someone puts an arm around my neck and holds me gently in a headlock. I glance down and see a large fist. A large black fist. Hawaii is a crossroad: people of Hawaiian, Japanese, Chinese, Korean, Filipino, Samoan, Fijian, Tongan, Vietnamese, and Laotians descent mingle with Caucasians from New Zealand to the US mainland to England and Germany. But there are virtually no African-Americans in the islands except those stationed in the military. It is Muhammad Ali, former heavyweight champion of the world and the most recognizable person on the planet, Pope John Paul II notwithstanding. Now it begins to make sense. Ali retired in 1976, but started fighting again the following year because he said he needed the money. Just three months earlier before he came to Honolulu, he fought Larry Holmes in Las Vegas despite warnings about his health — he had a kidney condition, was beginning to stutter and his hands trembled. He performed so badly in losing that Nevada was rumored to be preparing to suspend his license. He is in Hawaii hoping to get permission from the state boxing commission to fight an unknown British boxer named John L. Gardner. Someone in Ali’s camp obviously thinks Hawaii hasn’t gotten the news and will allow him to fight again. The state boxing commission is across the street from the building that houses the Star-Bulletin and our competitor, the Honolulu Advertiser. So after making his case to the commission, Ali has come to schmooze with the media. That’s how he found his way into the building. What led him into our untidy little corner of the newsroom, and why he picked me out for a headlock is anybody’s guess. But he got what he was looking for. I wrote a column about him a few days later, devoting most of the space to scorning Hawaii’s commission for tabling Ali’s request until Nevada decided about his license. Ali knew what was best for Ali, I wrote, and everyone else ought to get out of his way. Ali did get another fight, but not in Hawaii. In December of that same year, he fought against a Canadian named Trevor Berbick in the Bahamas, and lost that one, too. But that was yet to come, and I was wrong about saying that Ali knew what we best for himself, although perhaps by that time it was already too late. 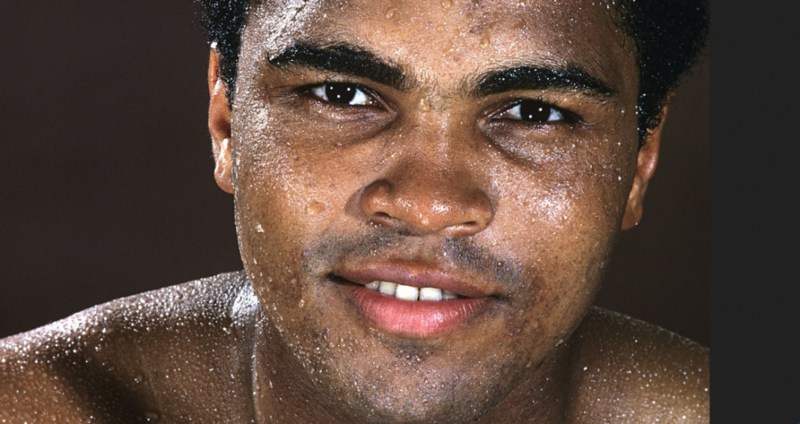 In 1984, the consequences of all the blows Ali took to the head over the years became apparent when he was diagnosed with Parkinson’s syndrome. By 1996, the disease had progressed so dramatically that when he lit the torch at the opening of the Olympic Games in Atlanta, his trembling and shaking were so pronounced and painful to watch it made me cry. By early 2013, he could no longer speak and in 2016 he died at the age of 74. The column I wrote after his newsroom visit focused on his right to fight and touched only briefly on his appearance in the newsroom. I did report that people hugged and kissed him, posed for pictures with him and asked for his autograph, but I didn’t do him justice. A pause here for context. I worked in five different newsroom during my career and visited at least half a dozen others. Generally speaking, they were not uplifting environments. Desks were gray or beige steel with black formica tops. The desks were covered with notebooks, newspapers, pens, books, old clippings, books, wire service reports and so forth. Lighting was creepy fluorescent blue-white, the walls were dull, and the floors carpeted with dark, industrial strength textiles. Newsrooms could be exciting places, especially when a story was breaking, but the dominant vibe was restrained, understated and even deflating. That’s what made Ali’s visit special. When he was young, Ali bragged about being beautiful, but what I saw that day wasn’t physical beauty, and it wasn’t about anything he said, because with one exception he didn’t say anything memorable. It was about the energy of the moment. Here he was, many times a world champion, famous beyond measure, widely admired and beloved as few human beings ever are, and yet he seemed genuinely joyful at spending a few minutes in the twilight gloom of a mediocre newspaper. At first Ali seemed subdued, but as admirers encircled him, he lit up, and he lit up the newsroom. He basked in the excitement of his admirers, and beamed his delight back them. He was the sun, they were the stars. It was such a joyful moment, I found myself watching my colleagues more than Ali. “They try to steal my charisma,” he joked. I don’t think so. We all arrived at that moment with back stories — our assets and defects, our cares and concerns, our joys and sorrows and, with a nod to a certain copy editor, our dreads. But for a few beautiful moments it wasn’t about any of that. It was about setting everything else aside, being human and real and connecting. The beautiful thing about Ali was his gift for being childlike, for being wide open and alive, totally in the moment. I don’t know if he ever thought about it, but instinctively he understood that the only way to enjoy that gift was to give it away, to share the moment with people who were as jazzed as he was. I saw Ali fight many times, and as great as he was, all his victories, all the money, all the fame and wealth were nothing next to those few beautiful, life-affirming moments in the newsroom. This entry was posted in Uncategorized and tagged 1996 Olympics, boxing, gift, Hawaii, Honolulu, Honolulu Star-Bulletin, Joe Frazier, journalists, Louisville, Muhammad Ali, newsroom on November 17, 2018 by John Christensen.